The Nasdaq index continues to trade within an upward trend. The nearest support and resistance levels are at 7953.1 and 7704.6. The course is positively affected by the meeting of US President Donald Trump and Vice Premier of China. According to preliminary information, Beijing is ready to make additional concessions in the field of high technologies, thus, the final agreement between the two countries can be signed in May. In addition, quotes are supported by good reporting by companies operating in the banking sector. JP Morgan significantly exceeded analysts' profit forecast, reaching $9.18 billion, or $2.65 per share, compared with the forecast of $2.35 per share. Net income rose by 7% against the previous year. Profit of the mortgage lending leader Wells Fargo rose to 5.86 billion dollars but revenue fell by about 1% compared with last year. Also, a positive factor for the stock market is the March Fed’s decision to keep the current interest rate at least until the end of the year. Stochastic is at the level of 25 points and does not give signals for opening positions. 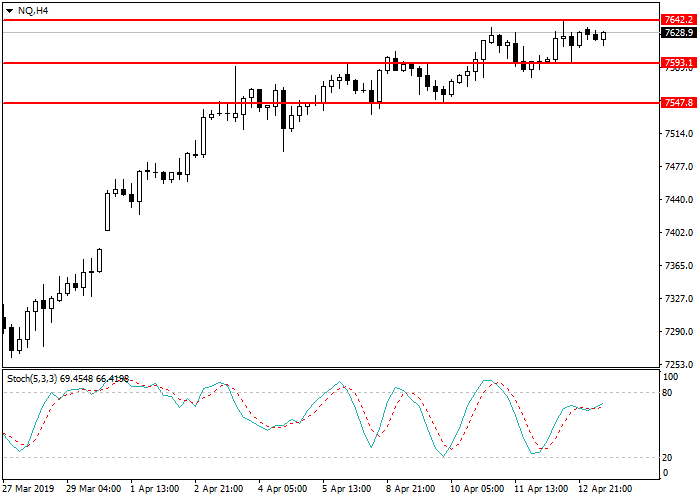 Long positions can be opened after the breakout of the level of 7642.2 with a target at 7704.6 and stop loss 7593.1.